PDF2CSV is a conversion solution that converts PDF to CSV/Excel and imports into Excel, QB Online, Xero, YNAB. Work for PDF2CSV (PDF to CSV/Excel Converter)? Super simplified the cumbersome process of converting transactions from a PDF to a CSV / Excel version. It is just a matter of uploading the file and with the click of a button I was able to produce documents in the format of excel that I needed. At first I thought some transaction details were missing, but realized it was a setting that I needed to edit. Had I not tried on a small sample database to test, I wouldn't have realized or known about this setting change to be performed. So an advise would be to test it out on sample database to see if all the data is converted correctly. If the PDF is very complicated it may miss out on them. So need to recheck each and every field if exported correctly. Best to try it out on a small subset sample data, change the settings of the tool as required and also thoroughly test out the final data report to ensure nothing is missed out (this is especially important in case of sensitive PDFs where some data may not be recognizable by this software. Most of the other times it works great and helps save a ton of a time. Helping with preparing a financial report and consolidating data from PDF to an excel document easily in an editable format. I needed to perform complex excel calculations and use a lot of formulas which was not possible in the PDF version of the document. It is a great tool if you are looking to convert a lot of data from PDF to CSV version. One of the best features of this tool is confidentiality especially when using it on sensitive data as it is locally installed and does not use any other websites / online sites wherein you may need to upload your data to convert it. IT is super simple to use, just upload source file, click on the type of conversion you need and done! I liked the tool and did not find much that I disliked about it. It was very simple to use and understand. Sometimes some data may not get read / converted correctly as it is a very data sensitive tool, but nothing that I could not easily correct for my purpose of use. I would positively recommend this tool to anyone wanting to achieve the same results. The tool is very simple to use. The tool may fail to recognize some very specific data formats and is sensitive to it, but for simple uses, it works perfectly without any issues. I do need to delete some data after I export it, but that's just my requirement and has nothing to do with the tool and its effectiveness. Sometimes I do see some data not getting read / converted correctly, but it was a one-off instance and I could easily adjust the small subset of data. I would recommend checking the data export after its completed to ensure correctness. I am trying to build an excel database which uses a lot of sensitive PDF data (Client Billing Rate for product) for my project. I am not allowed to share the PDF version with other teams and can only share certain fields of the data report. This tool helps me export the data from PDF to CSV and then I can easily delete the columns from CSV file, to share the remaining data with the other teams. "Relieved to find this simple and perfect tool." I am happy with this app, I don't think there is anything which I don't like. I was shocked and frustrated to discover that converting PDFs which I downloaded from my bank to CSV was so difficult. I was further in utter disbelief as to how many programs failed to do this. It seems like it should be straightforward and very simple. I almost gave up on this and entered a lot of data in manually, but when I finally tried *one more application* (PDF2CSV) I was delighted to discover what I had been looking for the whole time. A simple app which does this (seemingly) simple task -- and perfectly. I had a pile of bank and credit card statements in PDF format which I needed to be able to manipulate via Excel, and this allowed me to do that very simply. "Good alternative to scren scrapping"
1) It’s not optimized for the last version of mac. To easily digitize pdf transactional data in order to be processed in excel, avoiding to share my bank credential with third party software. "PDF 2 CSV Worked as Expected"
I needed a quick and easy way to convert PDF credit card statements to Excel in order to create expense reports. The product worked as expected and extracted the data. The data was lumped together and I had to spend a lot of time cutting and pasting it to extract the necessary information. Works as expected! Does not necessarily separate all of the details in a single line of data. May require some manual adjustment once information has been extracted. The benefit that I realized was the time that I saved importing information from PDF credit card statements. I would have otherwise had to type all of the information in, which would have been tedious and time consuming! CSV files are only available for limited amounts of time during the year. On occasion I am stuck with having to download PDF statements. PDF2CSV has helped me get those statement more quickly into usable data. Easy to use. It works fast and reduces a lot of redundancy and effort typing. There isn't anything I dislike about the product. If it were free, that would be great, but that isn't realistic. I needed to use the feature to create additional calculations from a .pdf I received. It is a go-to product for instances like this. Unfortunately I expected a higher level of accuracy from the software. I realise financial statements and invoices vary greatly, but I found myself manually amending the converted output to often. User-friendly and doesn’t require much training for my team. Nothing comes to mind. Overall, I like everything about it. Some clients keep their records in PDF form which makes updating data and adding formulas impossible. This is a good tool to convert data to a usable format. 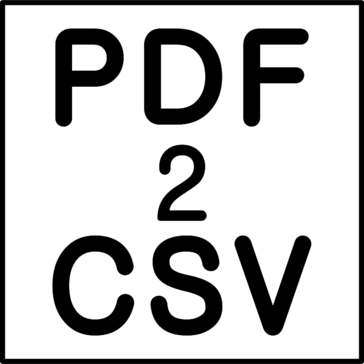 "Easy way to convert "
Learning about PDF2CSV (PDF to CSV/Excel Converter)? * We monitor all PDF2CSV (PDF to CSV/Excel Converter) reviews to prevent fraudulent reviews and keep review quality high. We do not post reviews by company employees or direct competitors. Validated reviews require the user to submit a screenshot of the product containing their user ID, in order to verify a user is an actual user of the product. Hi there! Are you looking to implement a solution like PDF2CSV?